The American Bicycle Association (ABA) officially unveiled their new iPhone App today. “Over 13,000 downloads of the application occurred during the 90 days of beta testing and the feedback was incredible. With technology advancing at a rapid pace, we want to stay in the forefront,” stated ABA CEO, B.A. Anderson. “For some time we have been delivering moto sheets via our wireless network at National events. Now with the new iPhone App it will be even easier.” This application is an answer to the request of many of our members. With the weekly airing of the television show on Versus, a monthly print publication, and the new iPhone app, the ABA is reaching out to audiences outside of our membership base to make every effort possible to grow the sport of BMX racing,” continued Anderson. The iPhone App is available as a free download at the iTunes Store. “I am sure we will be adding even more features to the app to meet the needs of our members,” said Anderson. 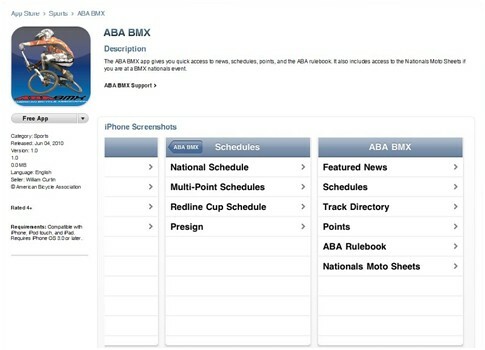 The new ABA iPhone App includes news releases, schedules, track directory with directions, points, a current rulebook, and a direct link to moto sheets at national events. I found the app easily on the iTunes store under ABA and gave it a test. It looks like a great app for BMXers, and handy if you’re traveling looking for new tracks.